Cologne Cathedral Treasury is the biggest and perhaps the richest in Germany. 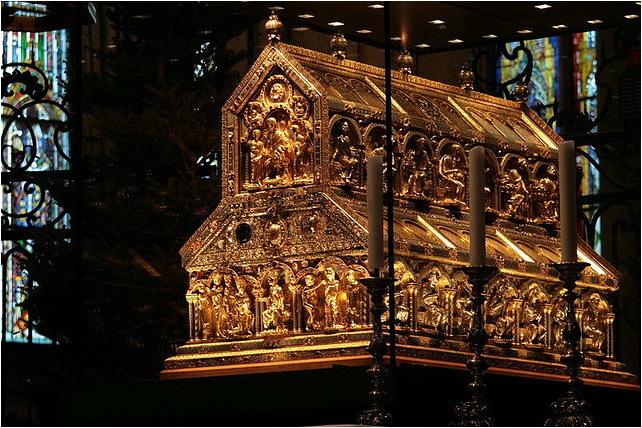 It originally developed as a collection of relics; in the Middle Ages the relics were seen as the real treasure, the costliness and artistic value of their settings being of secondary importance. The treasury’s contents reflect the vicissitudes of the cathedral’s history; it has suffered losses from robberies and has received gifts from bishops, popes and emperors. It is not a museum in the conventional sense, as practically all the objects on display are still in ecclesiastical use. It occupies two bays on the east side of the north transept and contains chalices, monstrances, reliquaries, liturgical vestments, manuscripts, silk materials from the relics of the Three Kings, and many other precious objects, including some early examples of Christian art that are over 1000 years old. The legendary crosier of St Peter (10th–16th centuries), a symbol of the apostolic succession of the archbishops of Cologne, together with the Gothic monstrance–shrine containing three links from St Peter’s chain, were carried before the archbishops in processions. The Shrine of the Cross of Cologne is an early 12th-century Byzantine triptych donated by the Byzantine EmperorAlexios I Komnenos; it contains a fragment of the True Cross. Other notable possessions include one of the finest surviving Late Gothic monstrances, made in Cologne around 1400 and donated in 1846 by Maria Theresia von Schaaffhausen, and a processional crucifix on which is a figure of Christ with fine enamels, made at Limoges in the 12th century. The most famous possession of the treasury has from early times been the golden Shrine of the Three Kings, attributed to Nicholas of Verdun and his workshop. The treasury also contains some outstanding medieval illuminated manuscripts, such as the Limburg Gospels from Reichenau. The Treasure Chamber is open for visitors all year round and the entrance fee costs 5 euros per adult, but a family ticket can be purchased for 10 euros.